Workshop and gallery slides of the Huggin Hill Baths and forum models in the MoL Roman gallery, variously taken by Kandor Modelmakers Ltd, Valhalla Ltd, and Jenny Hall. Photos supplied by Trevor Brigham, who also did the design drawings for both models in 1995/6. 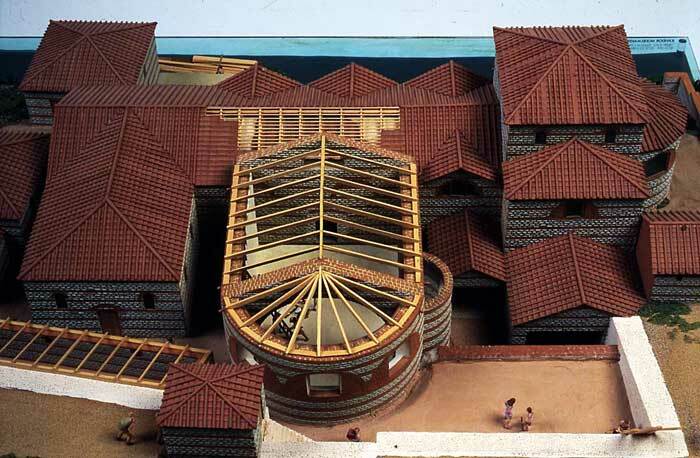 The Huggin Hill baths model was one of two commissioned by Jenny Hall for the revamped Roman Gallery. She kindly appointed me to do the design drawings and it was built by a local firm specialising in architectural models, Kandor Modelmakers Ltd, based north of Clerkenwell Road. We agreed that to show fine detail without being too big, the model would be at 1:100 scale. The ground plan, roof plan and elevations were reconstructed from pre-DUA and DUA excavation records (GM240 and DMT88) and hand-drawn on A1 acetate sheets. From memory, the model was largely built using a mix of hand-engraved Styrofoam for the walls, resin and plastic mouldings for the roof sections and other scratch-built details. 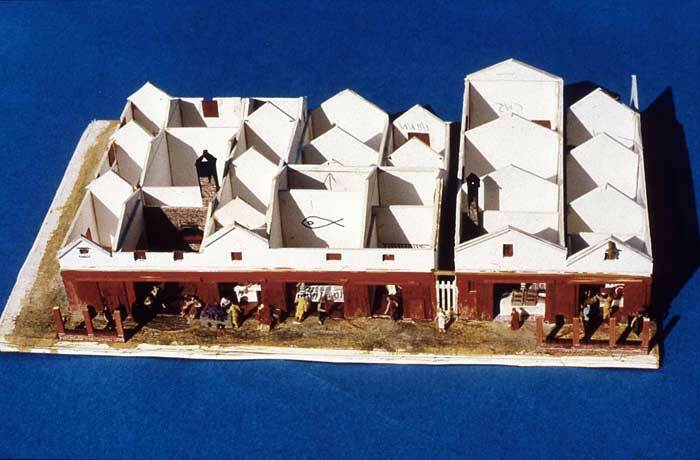 This meant that the number and height of the tile and ragstone courses, position of drains and typical Roman roofing etc could be exactly reproduced by the modelmakers from the drawings, selected photographs and design notes we supplied. All the 1:100 figures of construction workers were customised, so no two were alike. 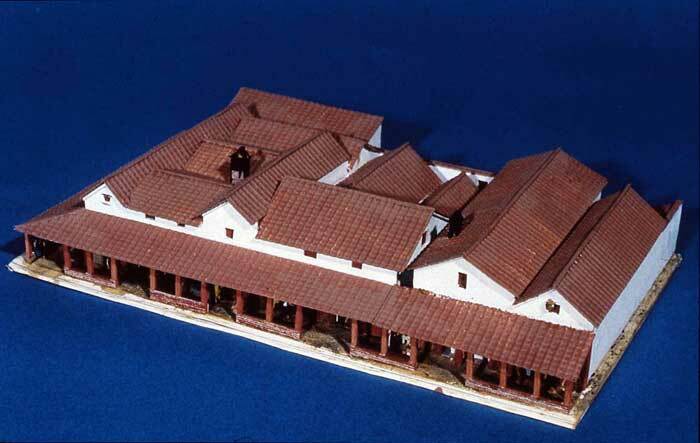 Because there was no clear dating or phasing evidence for the later additions to the original Flavian core of the baths, the notional date for the model was the AD 120s, the most likely date for the expansion, which may well have included separate women’s facilities. 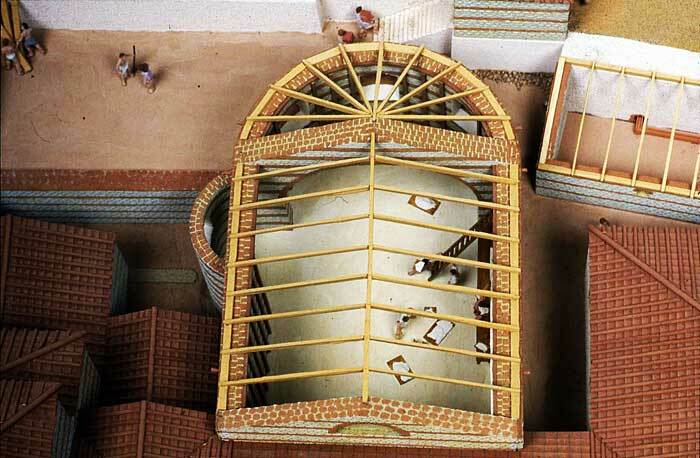 The additions were shown in different states of completion to highlight otherwise invisible details such as columns of box-flue tiles awaiting their covering of wall plaster in the northern caldarium, as well as roof, wall and hypocaust floor construction techniques. One interesting thing which the model highlighted was the way the builders had coped with the sloping site, also the proximity of the baths to the river: the landing stage was the only complete invention, based on the Pudding Lane quay. The forum model was also commissioned by Jenny Hall and drawn by me for the new Roman Gallery, using Valhalla Ltd who specialised in wargaming and period dioramas and had built the London Bridge/Pudding Lane model. We decided to show the forum in relation to a chunk of the surrounding town to give an idea of its massive scale and provide some added interest, but to keep the model at a manageable 2m x 2m, it was drawn at 1:150 scale. The chosen date was AD 150 to represent a time when most of the external additions to the forum had been made and the characteristic early blocks of densely-packed strip buildings were being replaced by larger town houses, with some plots being cleared and others not yet rebuilt after the Hadrianic fire. Plans of the base (including all internal walls) and roofs each covered nine A1 acetate sheets. Further sheets showed the elevations of the forum and surrounding street frontages, as well as internal cross-sections through buildings truncated by the glass case. Dozens of excavation archives and antiquarian records were trawled for their mid 2nd-century phases; the plans were then rescaled and drawn up in relation to an OS grid superimposed on the forum outline. Reconstructing the forum itself was fairly straightforward compared with the surrounding buildings and streets, as details taken from many sites on Cornhill, Whittington Avenue, Lime Street, Bishopsgate etc were very fragmentary, so the bulk of the plans were either made up or cribbed from elsewhere. 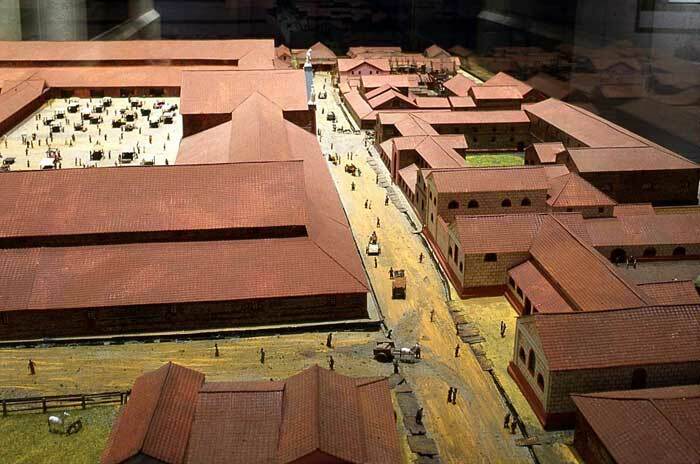 North of the forum, for example, is a block of townhouses lifted from Dom Perring’s Watling Court, and on the west side there are several blocks of strip buildings from different phases of Frere’s Verulamium reports! The model was largely scratch built using inscribed plastic sheet and mouldings, balsa, card, pre-printed paper facings and about 2000 adapted figures of people, horses, cattle, cats, dogs etc. The buildings included internal walls and many details which can only be glimpsed through doors or where buildings were half-sectioned by the glass case. Because of the level of detail, every visible room, shop and open space had to be assigned a function, and the model drawings were therefore accompanied by a thick sheaf of notes covering everything from building materials and window designs to details of shop contents and the type of vegetables grown on derelict plot.